Ride up the single track trail to the intersection with the dirt road which takes you up a moderate grade past the lower reservoir (about .6 mile) and then the upper reservoir (an additional .5 mile). From the weather station above the dam at the upper reservoir ride down the hill alongside the reservoir to where the road goes around a small finger of water. At the tip of the finger is a side trail to the right. Take this side trail to a fork near an old beaver pond and go left at the fork. This takes you through an old aspen forest. The trail will very soon turn sharply to the right. At the turn look to the left toward the base of the hill in front of you, this is the start of the Winding Stairs Trail; -- the first hundred feet or so is overgrown with vegetation and the trail is not very obvious, but it will soon turn into an old rutted jeep trail. This goes up a number of fairly steep, washed out switchbacks with deep ruts and erosion and you'll probably do much of this on foot; luckily this won't last too long (about .3 mile). 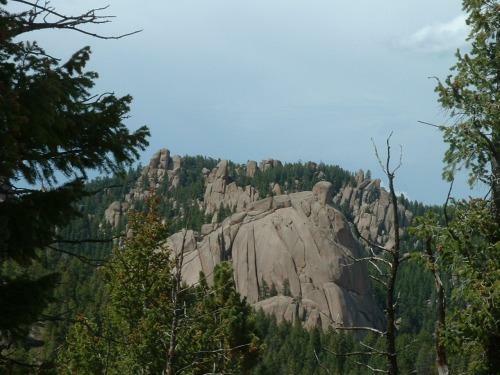 Once your at the top of this it gets much better with rolling hills and nice views of interesting rock formations. This trail will eventually intersect with and end at Rampart Range Road. Review: I think the topo of map is incorrect. You can see the trail on the map with red dashed lines heading west. There was lots of hiking for the first mile or so from the turn near upper reservoir. I did the loop to Rampart and back on Balanced Rock Rd 322. Great ride. Review: An alternate finish for this ride, which turns it into a loop, is to ride about 3 miles south once you get to Rampart Range Road to Balanced Rock Road and turn east. This road will take you back to the west end of the upper reservoir. It adds a few miles but makes it more interesting. Similar Trail: Mt Herman loop via Trail 715. Winding Stairs Trail MTB Trail 4.00 out of 5 based on 2 ratings. 2 user reviews.